PARIS: The planet’s largest colony of king penguins has declined by nearly 90 percent in three decades, alarmed researchers said Monday. 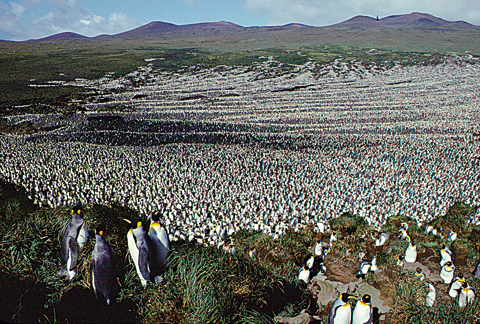 The last time scientists set foot on France’s remote Ile aux Cochons-roughly half way between the tip of Africa and Antarctica-the island was blanketed by two million of the flightless birds, which stand about a meter tall. But recent satellite images and photos taken from helicopters show the population has collapsed, with barely 200,000 remaining, according to a study published in Antarctic Science. King penguins are home bodies. While adults will set to sea for days at a time foraging for food, the species does not migrate. Why the colony on Ile aux Cochon has been so decimated remains a mystery. “It is completely unexpected, and particularly significant since this colony represented nearly one third of the king penguins in the world,” said lead author Henri Weimerskirch, an ecologist at the Centre for Biological Studies in Chize, France, who first set eyes on the colony in 1982. Climate change may play a role. In 1997, a particularly strong El Nino weather event warmed the southern Indian Ocean, temporarily pushing the fish and squid on which king penguins depend south, beyond their foraging range. “This resulted in population decline and poor breeding success” for all the king penguin colonies in the region, Weimerskirch said. El Nino’s are cyclical events that occur every two to seven years. But they can be amplified by global warming, which itself produces many of the same results, albeit on a longer timescale. Indeed, Weimerskirch and colleagues showed in an earlier study that climate change, on its current trajectory, will likely make the Iles Crozet-the archipelago that contains Ile aux Cochon-unviable for king penguins by mid-century. Migration is not an option because there are no other suitable islands within striking range. Other factors may be contributing to the decline of the Ile aux Cochon colony, including overcrowding. “The larger the population, the fiercer the competition between individuals,” noted a statement from France’s National Centre for Scientific Research, which funded the study. “The repercussions of lack of food are thus amplified and can trigger an unprecedented rapid and drastic drop in numbers.” But this so-called “density-dependent effect” can also be made worse by climate change, the study notes. Another possible culprit is avian cholera, which has affected seabirds on nearby Marion and Amsterdam Islands, including some king penguins. But until Weimerskirch and other researchers return to Ile aux Cochons-hopefully, he said, in early 2019 — they won’t know for sure. It is also possible that invasive species such as rats, mice or cats, have found their way onto the island. The Red List of Threatened Species conservation status for king penguins is currently “least concern,” but the new data may prompt a reevaluation. King penguins are the second-largest penguin species after the Emperor.